Yuya Osako was taken off at halftime. YOKOHAMA, Japan, September 9, 2014 – Defensive mistakes spoiled Javier Aguirre’s second game in charge of Japan as his team twice let leads slip away in a 2-2 draw with Venezuela at Nissan Stadium in Yokohama. After their 2-0 defeat to Uruguay in Sapporo on Friday, Japan started off brightly enough with Keisuke Honda firing just over the bar after 12 seconds. But it was a bit of a false dawn as the first half descended into a scrappy contest. Venezuela’s Rosales forced Japan goalkeeper Eiji Kawashima into a good save after 11 minutes, while Mario Rondon’s volley went wide in the 24th minute. Kawashima was again called into action to save from a decent effort by Rondon on the half-hour mark after some some poor play by Hosogai let the Venezuelans in. Venezuela continued to carve out chances but luckily for Japan the next three went off target. 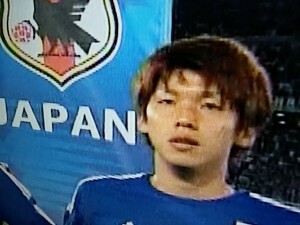 Japan sparked only occasionally but a nice move in the 38th minute forced a save out of the Venezuela keeper Herndandez. Aguirre realised changes were necessary at the break and took off the lightweight pair of Yoichiro Kakitani and Yuya Osaka in favour of Shinji Okazaki and Yoshinori Muto. The change paid off quickly for Japan. Six minutes into the second half, Muto seized on a poor clearance from Venezuela, sprinted forward 30 meters and rifled in a left-foot shot from just outside the box. Things were looking up and Maya Yoshida showed his confidence with a superb covering tackle in the 54th minute on Mario Rondon. But three minutes later his fellow defender Hiroki Mizumoto let him down. The Japanese defender allowed Guerra to rob him of the ball in the middle of the park and after a chase into the box, brought him down. Rondon stroked the penalty down the middle to make the score 1-1. Suddenly, the game was livelier. Honda was able to be more involved than the first half when there was no pattern to Japan’s attacking play, Muto was looking confident and Yuto Nagatomo started to make more runs down the left in conjunction with Okazaki. And it was Okazaki who turned it on for Japan’s second goal in the 67th minute. He sped down the left and put in a hopeful ball to the center where Gaku Shibasaki was on hand to sweep the ball home with a nicely controlled downward shot from 10 meters. After Vizcarrondo brought down Muto just outside the box, Honda had a chance to put the poor free-kicks from Friday’s game against Uruguay behind him and he did well but saw his shot rebound off the inside of the post. That was to prove costly when Cichero unleashed a speculative shot at the Japan goal in the 71st minute. Kawashima had it covered all the way but let it slip through his gloves to make the score 2-2. Kawashima made up for that with a neat save from a Rosales long shot in the 84th minute, but Japan couldn’t pull another goal back and Aguire will have to wait another month for his first win. This entry was posted on Tuesday, September 9th, 2014 at 10:20 pm. You can follow any responses to this entry through the RSS 2.0 feed. You can leave a response, or trackback from your own site.